You'll be £10.00 closer to your next £10.00 credit when you purchase The Ship of the Line. What's this? Each volume depicts a wide range of models, all shown in full colour, including many close-up and detail views. These are captioned in depth, but many are also annotated to focus attention on interesting or unusual features, and the book weaves the pictures into an authoritative text, producing a unique form of technical history. The series is of particular interest to ship modellers, but all those with an enthusiasm for the ship design and development in the sailing era will attracted to the in-depth analysis of these beautifully presented books. As always in these cases, the combination of the editorial quality of Seaforth books with text by authors with great preparation and professionalism has led to the creation of a volume that, among other things, benefits from a good quality / price ratio and that it is really recommendable to those who wish to deepen this fascinating topic. This is a fluent description of the development of the ship of the line made all the more lucid by the well chosen illustrations. The book is a small study on the evolution of ships of the line , included in a specific period between 1650 and 1850. To accompany the explanations of the study , the author has used photographs of a series of scale models of ships belonging to the National Maritime Museum in Greenwich addition to other pieces of various private collections. When I received the book, I felt a little intimidated by its small size. Accustomed to large volumes within this theme, I expected a much bigger book, a book that seems impressive even in your hands without looking inside. A book very interesting no doubt. This is one of those few books that have found the perfect balance and is already a small work of art. 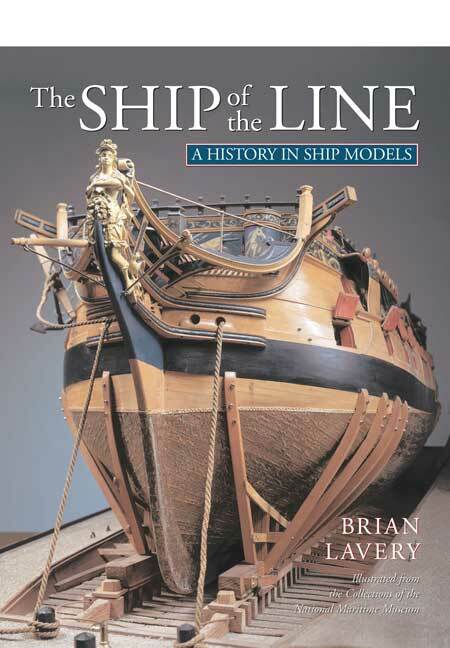 The author has selected models to illustrate the progressive development of the Ship of the Line and beautifully shot images complement text that demonstrates the breadth and depth of the author's knowledge, built up through a lifetime of study. Ship enthusiasts will want their own copy of this book, but it is also a work of art that will appeal to those with a peripheral interest in the subject but will enjoy the high quality full colour images. A great inspiration for modern modellers. This book utilises photographs of many of the best examples of models to tell the story of the evolution of this ship type, the capital ship of the day, and the epitome of British seapower during its heyday of 1650-1850. This is a beautiful book right at the start... Excellently written as one would expect from such an accomplished and experienced maritime history author as Brian Lavery... The text also offers a goldmine of information to anyone interested in the capital ships of the sailing navy of the 17th and 19th Centuries.